“B.OOM by B.DANCE” is an event which includes a series of collaborative performances. First held in 2016, European award-winning choreographers were invited to Asia to perform, the event reminded people of the “Fall for Dance Festival” in New York. B.DANCE Artistic Director, Tsai Po-Cheng was named as the annual representative for dancing by PAR (Performing Arts Review) Magazine, his talents for both curating and choreographing has made him the most promising star in performing arts. This year, B.DANCE will be joined with DPAC Arts Center in Kuala Lumpur, Malaysia, creating a whole new lineup. Performances include; “What Happened in Torino” from Italy, the solo was awarded 1stprize for dance and choreography at the Stuttgart International Solo Dance Competition. “Eran Casi Las Dos” from Spain, this piece had won 1stprize in the Madrid Choreography Competition. “Nervure” from Portugal, the piece which won the best performance award at the Copenhagen International Choreography Competition. “Zement” from Luxemburg, the piece which won the B.OOM Production Prize in 2017 Copenhagen International Choreography Competition. “Trial” from Vietnam, the piece which won 1stPrize New Dance for Asia in Seoul-Solo Duet Challenge for Masdanza. Last, a brand new piece, Othrus, from the choreographer, Tsai Po-Cheng. The B.OOM workshops will be arranged during B.OOM Festival, experienced guest choreographers will be teaching and exchanging dancing techniques with participants, creating a more active and vibrant environment for dancing. Andrea Costanzo Martini was born and raised in Italy where he received his first education in contemporary dance and ballet. At the age of 19 he moved to Munich, Germany where he attended the Heinz-Bosl Stiftung Ballet Akademien and in 2004 he began his professional carrier as a Ballet Dancer in the Aalto Staats Theater Essen. In 2006 He joined the BATSHEVA Ensemble and 2 years later moved to the main Company. During these years he performed extensively the repertoire of Ohad Naharin and Sharon Eyal and he began his activity as gaga teacher and Choreographer through the “dancer create” program of the Company. He later joined the CULLBERG Ballet in Stockholm where he performed for two years repertoire of Benoit Lachambre, Alexander Ekman ,Crystal Pite, Jefta Van Dinter and Tillman O’Donnel n 2013 he was awarded First Prize for both dance and choreography at the International Stuttgart Solo Competition for the solo work “ What Happened in Torino”In october 2015 the work "What Happened in Torino" is awarded the audience prize at the Mas Danza Festival in Gran Canaria, Spain. In December 2016 he is awarded the jury’s second prize at the “International Jerusalem Choreography Competition” for the solo “Occhio di Bue”. In November the work SCARABEO, Angles and the Void is selected as one of the AerowavesTwenty 2018 Festival. What would happen if every cell of my body could be observed by every other entity in the room (the ceiling ,the walls, the air , the audience)? What does it mean to expose oneself? Is it a generous or a selfish act? And in a more general level ,can movement precede and produce meaning? This are few of the questions I asked myself during the creation of the solo work "What Happened in Torino". The result is a journey between states of mind and physical expression, where I allow myself the liberty to obey and disobey my own rules as the performance unravels in order to be present both as a spectacle and a spectator. The solo was awarded 1st prize for Dance and Choreography at the Stuttgart International Solo Dance Competition in march 2013. A native of Tenerife, she has a degree in Choreography and Dance from the “María de Ávila” Higher Dance Conservatory of Madrid. She is the principal choreographer from the Carmen Fumero Company together with Miguel Ballabriga. In addition, she has worked for the company I+D Dance run by Ana Beatriz Alonso, Projects in Movement by Sharon Friedman, the Daniel Abreu Company in the piece Black, as well as in the project Trasdanza [‘Beyond Dance’] where she collaborated as a dancer and instructor. More recently, she has also worked with AI-Do Project by Iker Arrue, Dimo Kirilov and Tamako Akiyama, the Antonio Ruz Company and 10&10 Dance by Mónica Runde and Inés Narváez. As a choreographer, Carmen Fumero has directed various projects alone or together with Miguel Ballabriga. Thanks to the piece …eran casi las dos [’It was almost two’] both won first prize of the 29th Choreographic Contest of Madrid, and the RCH Award for ‘Best Performance’ in the 14th Burgos-New York International Choreography Contest. Her work at her company has been presented at the Mercat de les Flors in Barcelona, the Madrid in Dance Festival, the Tanec Prague Festival in the Czech Republic, the Siena Summer Festival, and the Jacob’s Pillow Festival in the United States. Currently, Carmen Fumero combines her work as a choreographer with collaborations with Dimo Kirilov, Iker Arrue, and Daniel Abreu. Since August 2018, she has also formed part of the LAVA Company in Tenerife, managed by Daniel Abreu. ...ERAN CASI LAS DOS is presented as a contemporary dance project, striving to tell a story as an event. The main idea of the manuscript unfolds at a meeting where a young man is waiting in a certain place for a woman to show up. They both have very different intentions for each other, and what is about to happen is the result of a previous conflict. Jill is a dancer, choreographer, film producer and founder of the JC movement production. Born in 1987, Jill Crovisier graduated with distinction in Ballet and Contemporary dance at the Conservatory of music in Esch/Alzette, Luxembourg before joining by selection the China EU Art school in Beijing organised by the British Council of Arts in 2005. She was a member of the Weis dance people company at the age of 18 and continued to study dance later on in France, NYC, Israel and Indonesia. As a freelance dancer, Jill worked among others in countries such as Luxembourg, Australia, Israel, Finland, USA, South Africa, Mexico and Laos. Choreography: Jill created R!CE, We are We, Zement, Zement the solo, The Hidden Garden, SIEBEN and the children’s piece MATKA. Since 2013 Jill works also in the production of short dance films and since 2015 she is involved in dance therapy projects. She is the artistic director of the JC movement production, based in Luxembourg. In 2017 Jill got selected with Zement, the solo at Lucky Trimmer, at the Hannover Choreographic Competition and won the CICC Taiwan production award at the Copenhagen International Choreography Competition. In 2018 Jill created SIEBEN for 7 dancers, her first one hour piece. Currently Jill dances for Cie Mirage (FR), Hannah Ma dance (DE) and tours her choreographic works Zement the solo, SIEBEN, MATKA and The Hidden Garden worldwide. In Zement, the solo, the young artist Jill Crovisier founded her choreographic research work on the theme of separation, particularly the symbolism of the wall. According to the choreographer, the human hand built walls , so he is the origin of all forms of separation, which aims to protect, enclose divide or destroy. Beyond the responsibility carried by humans on political decisions , the hand is also, personally seen, the mirror of his own life. Liliana Barros is a Portuguese dancer and choreographer, based in Germany. She studied at BALLETEATRO Escola Professional and at the Classical Ballet school Pirmin Treku, in Oporto, and graduated with BA in dance at Rotterdam Dance Academy, CODARTS. As a dancer she has worked professionally with companies such as Compagnia Zappalá Danza, in Sicily, under direction of Roberto Zappalá, Pretty Ugly Tanz Köln, under direction of Amanda Miller, Ballett des Saarländisches Staatstheater, in Germany, under direction of Marguerite Donlon and later Stijn Celis and Compagnie Marie Chouinard, in Montreal.She has performed both existing works and creations by Marguerite Donlon, Amanda Miller, Roberto Zapplá, Itzik Galili, Stephan Thoss, Marco Goecke, Marie Chouinard, Kurt Joss, Stijn Celis, Johan Inger, Jiri Kylian, Alexander Ekman and others. As a Choreographer, she has created several works for the ensemble of the Ballet des Saarländisches Staatstheaters such as: ILhektra, Persona, Claritas, Garden of Delight, Menagerie, Sentimental Animals and Collider/Vainglory. NERVURE is a solo project that was first called "Good by Pavlova". It started off with idea of departure/fall of a fake Icon/Icon to be, Pavlova, the clown? The character I longed to give life to. Not able to letting go, she deals with feelings of restlessness. NERVURE has been invited to the Lucky Trimmer Festival at Sophiensaelle and later also at Dock11 in Berlin, to TanzOFFensive Festival at Commedia Futura, in Hannover and to DanceWaves Festival in Cyprus. Originally from Madrid, he started his career as a dancer in 2002, practicing break-dance. For the past 12 years, he has formed part of the group Fusion Rockers where he is known as “B-boy Zomas”. In 2009 Miguel Ballabriga became a member of the Dani Pannullo Dance Theatre Company and also started to collaborate with other dance companies. Soon thereafter, he created and co-directed his own personal project together with Carmen Fumero, the Carmen Fumero Company. Thanks to the piece …eran casi las dos [’It was almost two’] both won the first prize of the 29th Choreographic Contest of Madrid. Simultaneously with his work at the Carmen Fumero Company, he was working with Dimo Kirilov and Tamako Akiyama, 10&10 Dance by Mónica Runde and Inés Narváez, Ai Do Project by Iker Arrue, as well as with choreographers such as Jordi Vilaseca in the Larrua Project, and Antonio Ruz. 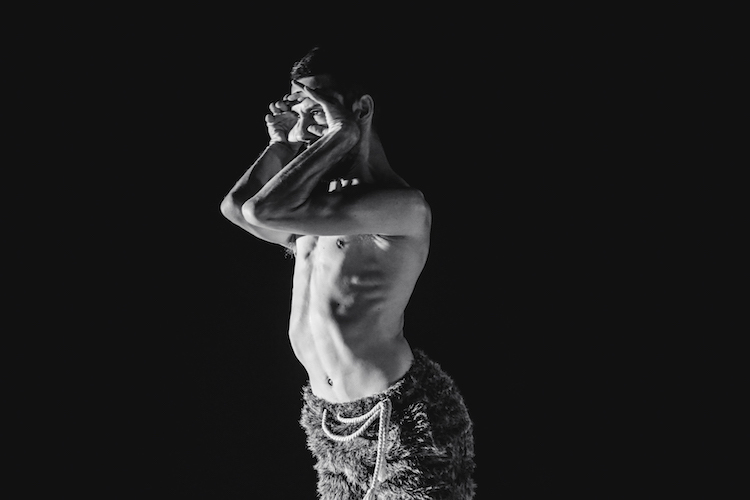 En 2018, Miguel Ballabriga was nominated as ‘Best Male Dance Performer’ in the Max Awards for his role in the piece Broken Lines by Dimo Kirilov. He currently combines his work in the Carmen Fumero Company with collaborations with Dimo Kirilov, the Larrua Project, the Dani Pannullo Dance Theatre Company, and the Antonio Ruz Company. Tu is a indepentdant dancer and choreoreahper from Hanoi, Vietnam. Currently, Tu is a dancers in Conny Janssen Danst Company, Holland. In 2018, his work, Trial, was awarded 3rd Prize and B.OOM festival production prize at the Copenhagen International Choreography Competition. And 1st Prize Winner at New Dance For Asia in Seoul-solo Duet challenge for Masdanza. Tu danced in the ballet companies over ten yesrs. Such as Vietnam National Opera and ballet, Cinevox Junior Company, Regensburg Ballett, BallettPforzheim Byaccident Dance, Ballett Stadttheater Pforzheim. Since 2016, Tu starts to serve himself as a free lancers, to work with different artists, such as James Sutherland, Olaf schmidt, Walter Matteini, Darie Cardyn, Anh Ngoc Nguyen, Darrel Toulon, Guido Markowitz, Antonio Gomez, Jacqueline Beck, Franz Brodmann, Lar Anderstam. In this duet, complexity and synchronicity seem inseparable when two men move harmoniously together. Quick impulses and detailed hand movements swiftly follow each other in this crystal clear presentation. Homogeneously they find tranquillity in their conformity between each other. However, small gestures and tensed actions hint at an underlying friction. Boundaries slowly start to appear and gradually grow stronger. In fear of staying behind a battle arises in which the men start to compete with one another. Pushing, challenging and ultimately racing till they lose each other and evolve into two separate identities. Thirty-one year old Taiwanese choreographer Po-Cheng Tsai graduated from Taipei National University of Arts in 2009. Following his education, Po-Cheng founded B.DANCE and established his unique choreographic language and aesthetic. By combining traditional Asian movements and martial arts with contemporary dance, B.DANCE offers theatrical, physical, and emotional performances that are approachable and inspiring for diverse audiences. Since it’s establishment, B. DANCE has presented performances nationally and internationally. Po-Cheng has been awarded first prize for choreography by numerous international choreography competitions. Furthermore, he has also created performances for a variety of recognized international dance companies, such as Introdans, Tanz Luzerner Theatre, Gauthier Dance, Cloud Gate 2, Bern Tanzcompagnie. Tsai has been designated Upcoming Choreographer of the Year 2018 by the German magazine “Tanz”. In Greek mythology, Orthrus was a two-headed guard dog who related to shown dead or dying.